In these you can see the new supplemental framing, twinned to the older wood. It’s been put up in order to create a level surface on which to build the walls, the old wood being rather haphazardly even. They’re not quite finished with this step yet, so Friday’s progress will probably be more of the same. 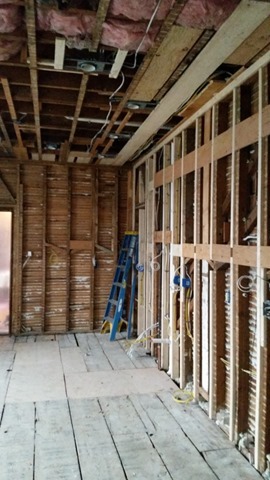 The other thing that’s happening is more electrical work, placing outlets and wiring where they need to be, while the walls are still open. Again, not something that pictures well. The shot on the left is the long wall opposite the window wall seen yesterday. Next to the door opening (just barely seen) will be a wall oven and microwave combo. Then as we march back towards the photo’s point of origin – some counter space wrapping around the corner, a sink, a dishwasher, the fridge, and a small bit of counter with bookcases above. The snap on the right is looking back towards the entry alcove, where the washer/dryer will remain behind their folding door (removed here for the time being). We had cabinets there – saggy, poorly made, hardware store cabinets, with a hanging bar below. We are redoing those cabinets to match what is being put in the rest of the kitchen, and retaining a hanging bar, which is just too convenient to lose. 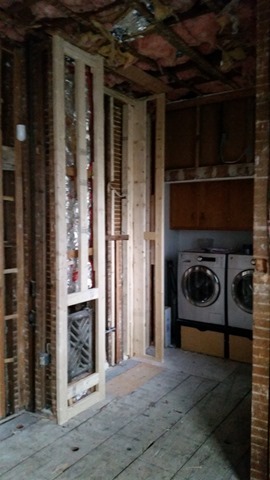 Unfortunately, in their zeal to demolish, the team took the old framing that supported the cabinet on the right (near the washer). Here you see the new replacement.